A spinal cord injury is a major medical emergency demanding skilled care at the accident scene and rapid emergency transport to a medical facility designed to treat patients with spinal cord trauma. The first few hours after injury are critical in preventing further damage to the spinal cord and in preserving function. The staff of the RSCICDV trains emergency medical service personnel, nurses and physicians to recognize and treat spinal cord injuries. The Center also works with area hospitals to encourage early referral of spinal-cord injured patients. Because Thomas Jefferson University Hospital understands that time and appropriate handling during transport are crucial to minimizing spinal cord dysfunction and saving lives, an SCI coordinator is on-call 24 hours a day to aid in referring and transporting patients to the Center. 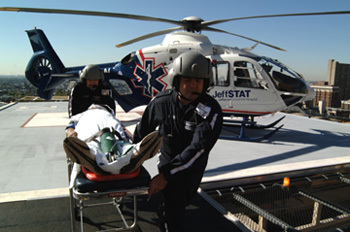 Also available at Jefferson is JeffSTAT, an emergency transport system that transfers critically injured patients from other hospitals to Jefferson. Once at Jefferson's Level I Trauma Center, specialized care begins immediately in the Emergency Department with a team of specialists from the RSCICDV, including neurologic, orthopaedic and trauma surgeons, rehabilitation medicine specialists and nurses experienced in the care of patients with spinal cord injuries.